How we produce, distribute, consume food is increasingly becoming the centre of the multiple crises we face today. Whether it is ecological crises of biodiversity decline, climate change or the health crisis of hunger, malnutrition and the spate of diseases like cancer linked to pesticides and toxics in our environment and food chain. These degradations affect every dimension of the food systems upon which we all depend and involve above all, the abandonment of natural and organic food systems, and accompanying diets, that were the foundation of human health throughout the world in most of known human history. 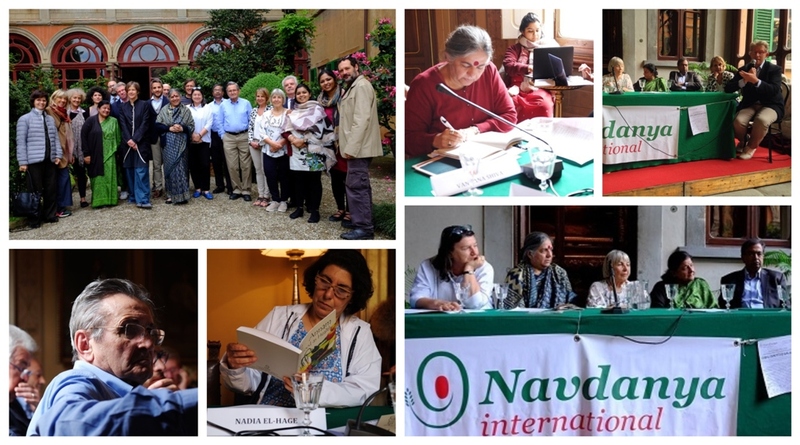 In May 2018, Navdanya International convened a Working Group of Experts, in continuation of the work of the International Commission on Future of Food and Agriculture, for a 2-day gathering in Florence to brainstorm ideas and contributions, and streamline the vision and concept structure which would be the base for the drafting of the Manifesto “Food for Health: Cultivating Biodiversity, Cultivating Health”. The Manifesto postulates that health, starting with the soil, to plants, animals and humans must be the organizing principle and the aim of agriculture, commerce, science, of our lives and of international trade and aims to create convergence between consumers, producers and stakeholders for a common vision of sustainable development in line with the Millenium Development Goals. 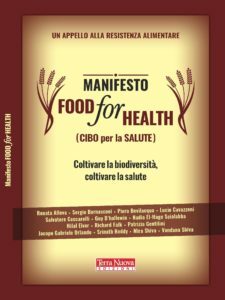 The Italian Edition of the Manifesto on Food for Health was presented at Sana, in Bologna, Italy, on 9 September 2018. The Manifesto offers scientific evidence, sustained by more than 200 bibliographical references to scientific studies and papers, on the inseparable link between the way our food is produced and our health. It aims at raising the alarm about the high chemical input in agriculture and food production that industrial agriculture and the Poison Cartel are spreading around the world, the harm it is causing to the health of people and the planet, and showing the way for the needed systems change towards a sustainable, agroecological and healthy future. It advocates the need for a new paradigm, a new way of thinking about health which is ecologically centered, a new paradigm based on systems thinking and not mechanistic reductionism, recognizing that the health of the earth and people’s health are inextricably linked and one continuum. The Food for Health Manifesto aims at helping strengthen the food and health movements as a whole by creating dynamic synergy between the movements for Sustainable Agriculture and Public Health and between consumers, producers and stakeholders. It shows how the root of the problem is a growing dependence on a dysfunctional paradigm that depends on pesticides and economies of scale to accelerate the quantities of food produced, but at the expense of nutritional quality, causing a wide variety of detrimental impacts on health as well as the ecosystem. These health effects adversely affect every stage of human life and range from still widely prevalent and growing undernutrition and malnutrition to a wide variety of chronic diet related diseases that are now the leading contributors to premature death and disability across the world. The justification for this emphasis on industrial agriculture, with its fossil fuel based chemical intensive agriculture and chemical intensive systems, centered around maximising production, is the need for sufficient food to feed a growing global population. As a matter of fact, this system produces instead nutrition empty commodities loaded with chemical poisons, radiations and toxics. The great benefits of biodiversity are seriously reduced by depending more and more on monocultures, which have harmful effects on the quality and range of seeds as well the biodiversity of all species. In addition, the industrial agri-food system consumes an immense amount of fossil energy, producing almost a third of all global greenhouse gas emissions, thus contributing to climate change. The majority of the food we consume is, instead, still produced by small and medium farmers, while the vast majority of crops coming from the industrial sector, such as maize and soya, is mainly used as animal feed or to produce biofuels. These high environmental and health costs are largely excluded from the pricing of food, creating the illusion that food produced is “cheap”. This ‘cheapness’ is artificially manufactured both through government subsidies paid to industrial agriculture, and by externalizing social, environmental and health costs, as well as by false prices through manipulation of the market by agribusiness monopolies. But there exists an alternative approach to food security that is based on biodiversity, combines quantity and quality, to maximise the benefits to the health and well being of the planet and people. The ecological paradigm of agriculture, food, nutrition and health recognises the complex living processes within nature and within our bodies, and between nature, other species and humans, as we are part of nature, not separate from her. It is based on a systems approach that is displacing the current experiences and trends toward degradation with policies, practices, and knowledge that ensures renewal, a revived reliance on the health potentialities of the natural food systems, working toward harmony with nature, food sovereignty and seed resilience in the hands of farmers, including a mindfulness of the environmental impacts of food systems. Alternatives do exist and are based on regenerating the health of the earth through agro-ecology, conservation of biodiversity, promotion of local economies and food systems “from field to table”. All over the world, small farmers and gardeners are already implementing biodiverse ecological agriculture. While rejuvenating the soil and saving and breeding their seeds, they are providing healthy and nutritious food to their communities. Civil society is creating self-organised ecological districts, where the common good is at the heart of local economic systems, which based on solidarity and cooperation, and continue to offer creative and innovative solutions, enabling communities to regain their food sovereignty often succeeding in making the large agrochemical multinationals irrelevant. The health of the planet and the health of the people are one. The right to health can be realised only if the right to good nutrition is recognised, respected and realised. It is possible to create good health through good nutrition. For this we have to transform our food systems. This task is pivotal for not only for reaching the Sustainable Development Goals of 2030 but for ensuring human and planetary health in a sustainable manner over a longer future. In March 2019 Navdanya International launched the Campaign Poison Free Food and Farming 2030 – an invitation to women and young generations, citizens and people in institutions, indigenous people everywhere, farmers, producers and consumers of food, local communities north and south, from the local to the global, who are already mobilizing to defend the earth and future generations, to create a unified movement for change. Alleva, R. et al, “Mechanism underlying the effect of long-term exposure to low dose of pesticides on DNA integrity”, Environ Toxicol., 2018. Alleva, R. et al, “Organic honey supplementation reverses pesticide-induced genotoxicity by modulating DNA damage response”, Mol. Nutr. Food Res., 2016. Andò, S., Università della Calabria, “The Heritage of the Mediterranean diet / Il patrimonio della Dieta Mediterranea”, supplemento di Stringhe, rivista di divulgazione scientifico-culturale dell’Università della Calabria, 2015. Bernasconi, S. et al, “Gli interferenti endocrini in pediatria: le evidenze attuali”, Clinica Pediatrica, Dipartimento dell’Età Evolutiva, Università di Parma, Il Cesalpino, Approfondimenti. Bevilacqua, D., “Introduction to global food safety law and regulation”, Groningen, Europa Law Publishing, 2015. Bevilacqua, D., “Public participation in science-based decision-making: more pluralism for more health protection”. Bevilacqua, P., “Healthy food: the most powerful medicine ever invented”. Ceccarelli, S., “Stuffed or starved? Evolutionary plant breeding might have the answer”, 2018. Ceccarelli, S., “Morire di fame o morire mangiando?”, 2018. Ceccarelli, S., “I semi del futuro e il futuro dei semi”, 2016. D’Hallewin, G., “Plant biodiversity and cultural heritage to assure safer and healthier food”. D’Hallewin, G., Cnr – Ispa Uos Sassari, Camarda I. – Dip. Agraria UNISS Sassari 2, “Caso di Studio: Sardegna, frutti dimenticati e biodiversità recuperata”, Quaderni Natura e Biodiversità, 7, Ispra, 2015. Eggersdorfer, M., “Good nutrition: perspectives for the 21st century”, Karger, 2016. Elver, H., “UN special rapporteur on the right to food: report A/71/282”, agosto 2016. Elver, H., “UN special rapporteur on the right to food” in Tuncak, B., “Special rapporteur on the implications for human rights of the environmentally sound management and disposal of hazardous substances and wastes. Report A/HRC/34/48”, gennaio 2017. Elver, H., “Why nutrition matters?”, agosto 2016. Enders, G., L’intestino felice, Sonzogno, 2015. Falk, R., “Changing the political climate: a transitional imperative, tellus institute for a great transition”, settembre 2014. FAO, “Methodology for valuing the Agriculture and the wider food system Related Costs of Health (MARCH)”, 2017. Francis, C. et al, “Agroecology: the ecology of food systems”, J. Sustainable Agriculture, 2003, vol. 22, pp. 99-118. Gentilini, P., “Esposizione a pesticidi e salute umana”, La voce dell’ordine di Pistoia, Anno X, n° 32, dicembre 2015. Gentilini, P., “Inquinamento ambientale e salute riproduttiva”, Il Cesalpino, 42/2016, Ambiente e salute. ISPRA, PAN Italia, Gruppi Ricerca Ecologica, Università Politecnica delle Marche, ISDE – Medici per l’Ambiente, Università degli Studi di Parma, European Consumers – A cura di: Pietro Massimiliano Bianco, “Note sull’inquinamento da pesticidi in Italia”, 2017. Mercati V., (ABOCA Group President), “Organic agriculture as a paradigm of sustainability: italian food and its progression in the global market”. Muller, A. et al, “Strategies for feeding the world more sustainably with organic agriculture”, Nature Communications, 2017, vol. 8. Navdanya, “Seeds of hope, seeds of resilience – how biodiversity and agroecology offer solutions to climate change by growing living carbon”, 2017. Navdanya, “Health per acre”, 2016. Navdanya International, “Food, toxins and health / Cibo, sostanze chimiche tossiche e salute”, 2018. Navdanya International, “Il veleno è servito: glifosato e altri veleni dai campi alla tavola”, A Sud, CDCA, 2017. Navdanya International, “The toxic story of Roundup”, 2017. Primary Health Care ~ Report of the International Conference on Primary Health Care, Alma-Ata, USSR, 6-12 settembre 1978. Reddy, K.S., “Diet, Nutrition and Human Health: Moving Beyond reductionism”. Reddy, K.S., Fifth, I., Scudder, S., “Humanitarian oration”, The National Medical Journal of India, 2017, vol. 30 (1). Shiva, M., “L’invasione del cibo industrializzato e del cibo spazzatura” in Cibo e salute, Navdanya/Terra Nuova Edizioni, 2018. Shiva, V., The violence of the Green Revolution, University Press of Kentucky, 1991. Shiva, V., “Monocultures of the mind” in Kimbrell, A., Fatal Harvest. The tragedy of industrial agriculture, Foundation for Deep Ecology, 2002.